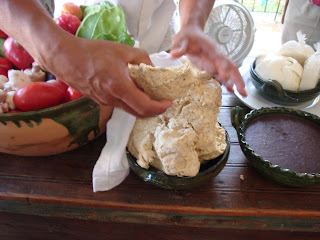 Masa harina - corn flour dough for tortillas. There’s nothing wrong with a white Christmas. However, some people often forget that other cultures celebrate Christmas too. Even those without access to spruce trees and snow. This year, I had no problem hopping on a plane and leaving behind Edmonton’s -20 degree Celsius temperatures. I spent this Christmas on a beach. 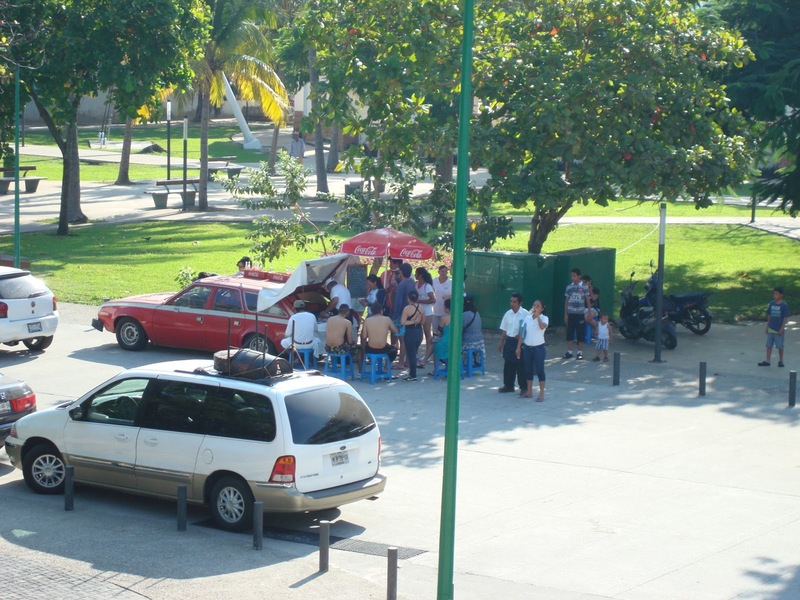 In Mexico. Huatulco, to be exact. This region is in the state of Oaxaca, and is home to nine beautiful bays, soft white sand, and coral reefs. And some spectacular food. The state of Oaxaca is famous for its cuisine. They are known for seven different “moles” – rich sauces often made with chocolate. The region is also rife with delicious street food – these foods are often cheap, quick to assemble, and easy to eat on the fly. 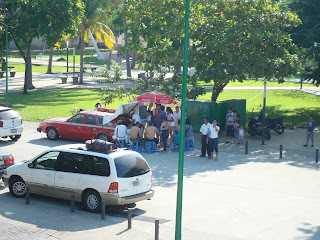 Street food is a pivotal component of many cuisines, from Mexico to Mumbai. Tacos are the best example of Mexican street food, and are a lucrative business requiring a few ingredients and some form of transportation. One savvy individual had established a lucrative business in the back of a well-preserved Ford Gremlin in Santa Cruz. 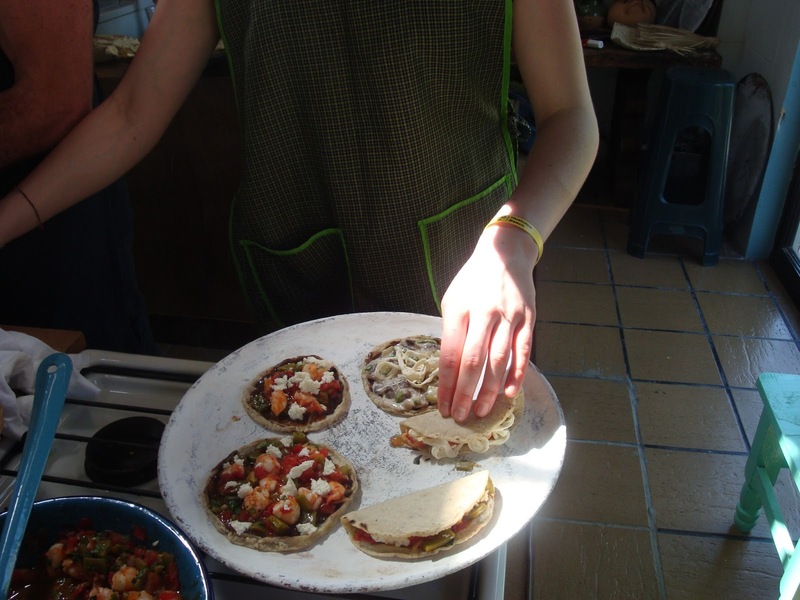 The Chiles and Chocolate cooking class was held in Santa Cruz at Cafe Juanita, a tiny bistro popular among locals and tourists alike. We made corn tortillas from raw masa, watching them puff up on a terra cotta disc called a “comal”. The tacos were filled with . Queso Oaxaca or “quesillo” – a stringy cheese wrapped like a ball of yarn – was used to fill several small quesadillas. We made two kinds of tacos: a typical breakfast variety with zucchini, mushrooms, and sour cream; and a lunch taco with shrimp, tomatoes, and a cactus called “nopale”. 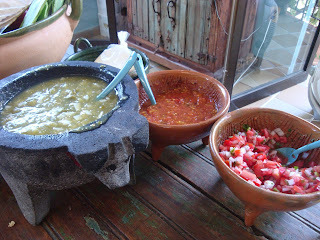 Garlic, tomatoes, tomatillos, and chiles of various types were assembled in various combinations to create four different salsas to serve with each dish. Warming tacos on the comal. When I returned to my Canadian climate, I tried to recreate the experience at home with store-bought instant masa harina (corn flour). I was horribly disappointed at the results. Not only was I lacking some necessary equipment (a tortilla press and a comal), but I sorely missed Mexico’s high humidity. My dough dried out in minutes, and I was left with taco shells that were dry and torn. I’ll try again once I am better equipped, and can deal with Alberta’s cold, dry climate again. It’s gonna take some getting used to. 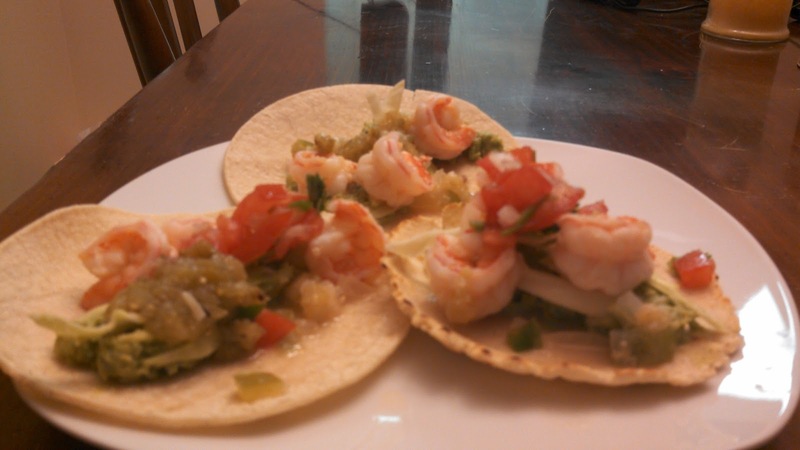 I did however invent a delicious way to cook shrimp to fill store-bought tacos. With beer, of course. And a lil’ bit of tequila. Don’t add to much, or it might “ta-kill-ya”. See This is Why I’m Hot for Pico de Gallo and Guacamole recipes. Heat oil in a large frying pan over medium heat. When hot, add the onion and garlic. Season with salt, and cook until onion begins to sweat, about 8 to 10 minutes. Add the tequila and beer, scraping the bottom of the pan to incorporate any browned bits. Return the pan to heat. Add the shrimp and cook until they turn pink, about 3 minutes. 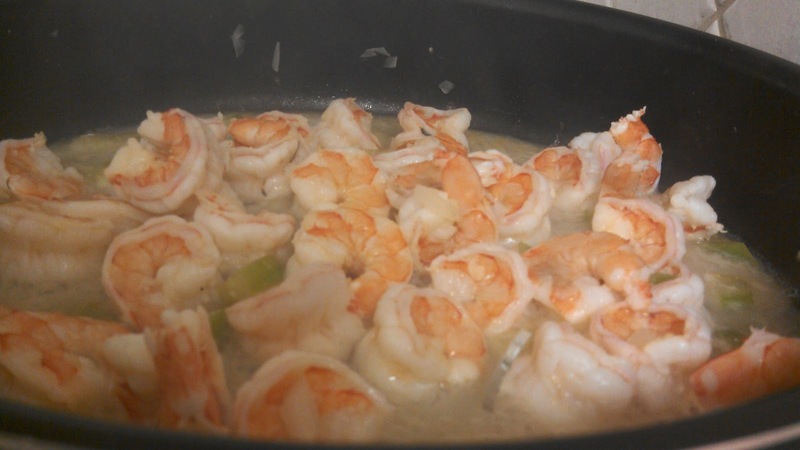 Remove pan from heat and stir in the lime juice. Season with salt and pepper to taste. Serve as tacos with cabbage, pico de gallo, guacamole, and cheese as desired. Note: Cheddar cheese has no place in Mexican food. As soon as you add it, your meal becomes “Tex Mex”. Just don’t.